This post contains affiliate links. That means that if you make a purchase after clicking on a link I may earn a small commission at no extra cost to you. Traveling the world by motorcycle is, simply put, a thrilling adventure. Discovering off-the-beaten track places with your own two wheels. It’s an unrivalled sense of freedom. Having the right gear to take up such an adventure makes your new-found life as nomad a lot easier. That said, you don’t need the most expensive gear and equipment. All you really need is a motorcycle and the courage to start riding. One of the most essential pieces of equipment is your camera. Every day is filled with new landscapes, new people and new impressions. It can be overwhelming at times. Having a camera to record it, and look back at your photographs or footage later, helps to process all this new information. If you’re thinking of starting a YouTube channel, your video camera is your most valuable asset. I record all my footage for my YouTube channel with one single Go Pro: the Go Pro Hero 7 Black. At the time of writing, it’s the latest Go Pro model on the market. This action camera has state-of-the-art image stabilisation, which allows for stable footage even if you and your motorcycle are flying over bumpy roads. It still amazes me everyday how clear, sharp and stable the imaging is. This GoPro comes with quite a few settings that you can customise to your liking. I normally don’t have time to fiddle around with the settings while on the road. So I use the ‘auto’ function and always record in 4K resolution, at 60 frames per second and with a wide angle. You can check out how the footage of this camera looks like here. Besides the camera itself, there are several accessories for the Go Pro that I use on a daily basis. The battery life of the Go Pro is, in contrast to the camera itself, not very impressive. Typically, I need 2-3 batteries for a day of recording. To make sure I always have fresh, fully charged batteries for the next day, I have total of 6 batteries. Three batteries are from Go Pro itself, and 2 batteries are from Smatree. These additional batteries came with the charger that I purchased. You can charge three batteries at the same time with this charger. I use it every day and because it’s quite cheap, I can highly recommend getting one of these. Especially when you are very active with your Go Pro. I haven’t noticed any difference in battery life between the Smatree batteries and the original (expensive) Go Pro batteries. Go Pro sells all kinds of mounts you can use in different ways. Most of the footage I record from the mount on the chin piece of my helmet. I got creative with the Go Pro wrist band mount which I wrapped around my brake fluid compartment on my handle bar. This angle records my face while riding and changing the video angles works nice in editing videos. One mount I placed on my side pannier, and one on my topbox. On a local market in Malaysia, I found an extension piece which I now use on my topbox. Using this extension piece, the angle is much better and gives the impression of a pillion view. The final angle to record while riding is holding a ‘selfie' stick with the Go Pro mounted on it. I can’t say it’s my favourite angle and I don’t do it very often. Only on nice, quiet roads I sometimes use this to record my motorbike and myself while riding. But there is more! At the bottom of the stick, you can unscrew a small tripod. In combination with the timer on the Go Pro (either 3 or 10 seconds delay), you can use this combination to take photos too. Even though the Go Pro takes high quality photographs, I carry a separate camera for that purpose. I chose the Canon Powershot G7X Mark II camera for taking photographs. I love this camera because of its small size and good quality pictures. It has a wifi option which you can use to transfer the photographs directly to your phone (without actually requiring wifi - its brilliant). Just download the Canon Camera Connect app and you are all set! The problem that every solo traveller faces (at least at some point along the journey) is how to get a great shot when there is nobody around. One can always choose for the selfie option, but to get more dynamic pictures of you and the motorbike in the entire frame, you need a tripod. I found a great, high quality tripod with sufficient height to create a great angle. In the beginning of my journey I was also traveling with a Canon 80D SLR. A great, but relatively heavy camera. This tripod is suitable for those heavier cameras, which I why I chose it. As my focus shifted from photography to making video, I barely used my 80D any longer. Eventually I decided to send it back to The Netherlands, but I kept the tripod. There is even a special Go Pro mount which you can use, so I can mount both my Go Pro and my Canon Powershot on this tripod. I added quite a few after-market items to my Royal Enfield Himalayan. You can read more about those here or check out this video. When I first started my journey from India, I only used Google Maps for navigation. Mostly it worked fine, but when I reached Thailand, I bought a Garmin Zumo 396 GPS system. I didn’t want to be so dependent on my phone for navigation. I also wanted to be able to navigate in the rain without having my phone exposed. I bought the Garmin in a motorcycle shop in Thailand. They installed the holder for me and connected it to my motorcycle battery. This allows for the device to charge automatically while riding. Excellent! This Garmin GPS system automatically comes with pre-loaded maps of the area where you buy it. In my case, it had the maps of South East Asia (Thailand, Laos, Cambodia, Malaysia) on it. Additionally it had maps of Europe as well. When you want to use this device to travel around the world, you have two options. You can buy additional Garmin regional maps, or you can download the free Open Street Maps (OSM). Since I am riding in Iran and Central Asia (Turkmenistan, Uzbekistan, Kazakhstan etc), I had to opt for OSM because Garmin didn’t produce maps for this area. In Dubai I went to the Garmin shop to ask for help. I didn’t know how to install these OSM on my Garmin device so they did it for me. For free! Because it’s quite time consuming to get all the maps, I just dropped off my device and picked it up the next day again. What I love about this Garmin GPS system is that its rugged, waterproof and can take quite a beating. It shows important amenities such as petrol stations and restaurants. Its geared towards motorcycles, so you can also let Garmin choose nice, curvy roads for you if you want! Navigating to a specific address within a city, such as a guesthouse of mechanics shop is more difficult with this device. So when I’m searching for these type of places, I use my phone again. I now use the app “Maps.Me” which I prefer over Google Maps. One of my favourite items is my Kriega hydration system. I chose the 2L version, which is enough for most riding days. Being able to drink water while riding (by just sliding the tube underneath your helmet) is fantastic. Especially while riding in hot climates, it’s essential to keep yourself hydrated. If I would have known about this product earlier, I would have purchased it directly at the start of my trip! I have the simple Sena 3S headset incorporated in my helmet. After setting it up once, it automatically connects to my phone via bluetooth. I listen to Spotify music during all my rides! This is one of the cheapest and most basic versions of the Sena systems. The device that’s placed on the side of my helmet is only for raising or lowering volume, but that’s all I need. I don’t need to talk to other riders as I always ride solo. The sound quality is excellent. The only disadvantage is the short battery life. I have to charge it after each day of riding. After two months of riding with a backpack strapped on the back of my bike, I changed to a proper luggage bag. I bought the SW-Motech 350 dry bag. With a simple 4-strap system you can easily strap it on your motorcycle. The material is strong and durable and fully waterproof. It has a large opening at the top which makes it easy to pack and unpack the bag (very important if you have to do this on a nearly daily basis). I would have appreciated some split compartments, but unfortunately this bag doesn’t have that. I am wearing 100% Kevlar John Doe Betyhigh riding pants. These pants come with advantages and disadvantages. The main advantage is that they look like jeans, and are very comfortable. The material is extremely durable and even after wearing the pants day-in, day-out (and many laundry rounds), they still look and feel like new. They are very warm so suitable for colder climates, but once you hit the tropics, they start to become uncomfortable. Furthermore, they are not waterproof. On my next big trip I wouldn’t go for these type of pants again, but if you’re riding mostly on dry and sunny days up until 28 degrees Celsius, I can recommend going for them. My helmet is an Arai Chaser-V, a special Ducati edition. I bought this helmet together with my first motorbike, a Ducati Monster 796 in 2015. When I started this trip, I didn’t want to invest in another expensive helmet, so I decided to keep my ‘old’ one. It’s obviously not a touring/off-road/adventure helmet and on my next big trip I would probably go for a helmet more suited for my type of travel. The main reason for that is that this Arai helmet is quite heavy, a bit noisy and it doesn’t have sun protection. But when it comes to quality and durability, I am very happy with the helmet as it has seen practically no wear after extensive use. As with my helmet, I already had a set of Ducati boots (Ducati TCX Sport 2). I didn’t want to spend money on a new pair when I still had good boots. As with the helmet, they are not the typical adventure bike boots, but they are strong, durable and comfortable. I travel with two different jackets. The black Alpinestars jacket that I wear is the Alpinestars T-GP Plus R v2 Air Jacket. It comes with an inner liner which is easy to remove when it becomes too hot. It has two inner pockets and two outer pockets. The shoulder and elbow protection pads are of solid quality and the jacket is very comfortable to wear. I have been wearing this jacket in a temperature range of about 10 - 30 degrees Celsius. Above 30 degrees Celsius, or with extremely high humidity, I wear another jacket. I choose the Rev’it Eclipse jacket. It’s light colour is cooler when riding in the sun and the mesh at the front side of the jacket and the sleeves let air pass through. It wears comfortable and breezy and is of good quality. I have been riding with Royal Enfield gloves. The first set I used was thin and very comfortable to ride in. But because I used it excessively, the velcro got a bit damaged along the way. In Dubai, I was gifted a new pair by the Royal Enfield dealer there to support my trip. These are more a heavy-duty type and generally a bit warmer too. Even though my Kevlar riding pants provide sufficient protection, I always ride with extra knee guards. In India this is very common among motorcyclists and I thought: why not? I got some cheap ones in India which I upgraded to Titan Pro knee guards when I reached Thailand. These are of better quality and can take a hard hit! I love to ride in remote, mountainous areas and explore dirt tracks. This comes with risks. Whether it is a potential bike breakdown or a personal injury, you may find yourself alone and in need of help. If there is no telephone network, this can be tricky. I travel with a Thuraya XT-LITE satellite phone which I topped up with 50 dollars worth of credit. This allows me to ring any number (local or foreign) whenever I would need help. It’s an expensive device but for me it’s worth the investment. I hope that I’ll never need to use it, but I’m glad I have it with me. Another invaluable item that has been part of my standard travel kit is a travel safe. I used the small sized, 5L PacSafe for several years while backpacking around the world. This one is big enough for a passport, camera and wallet. It has stainless steel wire all through the bag and you can chain it to a piece of furniture for example. I used it in hostels or hotels where I didn’t have a safe to lock up my valuables. Now that I have a YouTube channel, I travel with a laptop. So I bought the large sized, 12L PacSafe which fits my laptop too. Knowing that your valuables are safe inside your room while you explore a city gives a great piece of mind! Just in case I leave my lights on and my battery is dead, it’s quite handy if you can jump start your own bike. Especially when you find yourself in an area without cars and/or jump cables. 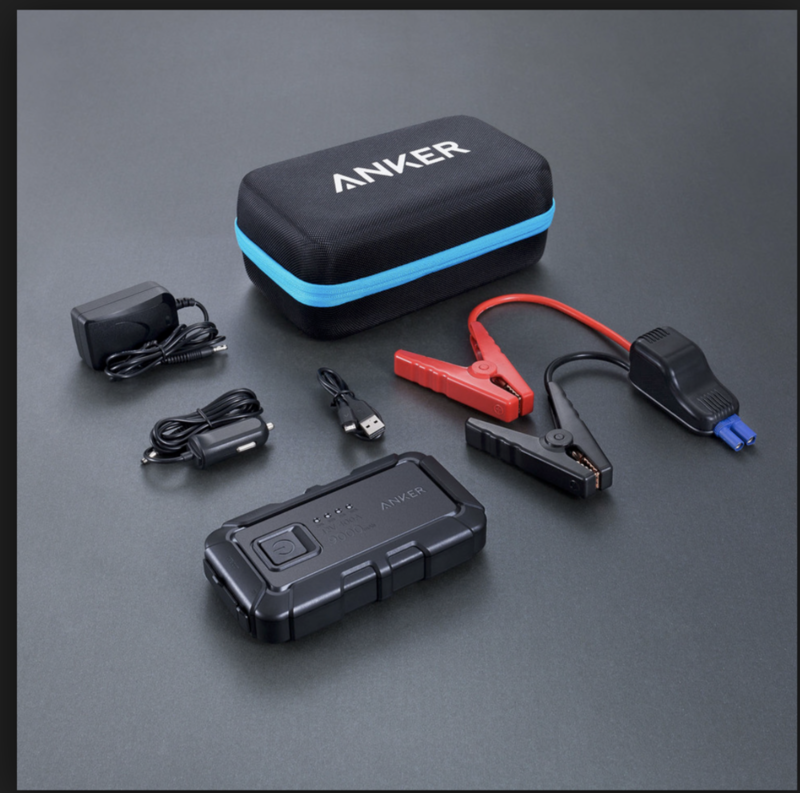 I have the Anker PowerCore Jump Starter. Fully charged it has enough power to jump start a motorbike three times. Additionally, you can also charge your phone with it if necessary. That’s it. My most valued equipment to ride around the world on a motorcycle. But don’t forget: all your really need is a motorcycle, cash in your pocket and the will to take on the world!